The Gerson Therapy was developed over 80 years ago by Dr. Max Gerson and is best known for its success in the treatment of cancer, but has also proved valuable for a large number of other chronic diseases. In the book, Healing The Gerson Way, Charlotte Gerson, daughter of Dr. Max Gerson, outlines the principles and methods of this natural approach to healing, as it was originally practiced by her father, and is currently provided in Gerson Centers around the world today. The Gerson Diet is a therapeutic approach to healing that places a large emphasis on the consumption of fresh juices. At least eight glasses of fresh juice are to be consumed daily in precise combinations including ingredients such as orange, carrot, apple and certain types of leafy green vegetables. In addition to the juices a wide variety of unprocessed foods are consumed including a high intake of raw fruit and vegetables. However, this is not a raw food diet and certain cooked foods are regarded as an essential part of the program including oatmeal, potatoes and a special vegetable soup. An important element of this healing cancer and disease method is the use of coffee enemas, which have the purpose of increasing the elimination of toxins and relieving pain and discomfort. Coffee enemas are generally done every four hours and are regarded as absolutely essential to the success of the program. The book includes a large number of case histories of people who have recovered from cancer and other serious diseases by following the Gerson protocol. It also provides information about the various nutritional supplements that are part of the program, drug-free methods of pain control and how to adapt the therapy for chemo-pretreated, severely weakened patients and nonmalignant diseases. Fresh juices, fresh and dried fruit, raw and cooked vegetables, baked potato, oatmeal, organic rye bread, flaxseed oil. 8-10 glasses of fresh vegetable juice are consumed at hourly intervals throughout the day in addition to the foods listed below. The Gerson Diet is generally undertaken by those with serious illnesses and these people are advised to avoid most exercise until their health improves because it could slow down the healing process. Yoga however is recommended because it is gentle and can help Gerson patients improve their flexibility, stamina and muscle tone. 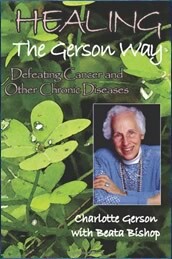 Healing the Gerson Way retails at $29.95. Undertaking this program will also require the purchase of a commercial juicer, which costs over $2000, as well as a high amount of fresh organic produce. Offers a natural alternative for the treatment of cancer and other chronic diseases. Diet is low in fat and high in nutrients, which is beneficial for prevention and management of heart disease. Addresses the importance of psychological support for overcoming serious health conditions. Provides explanations about medical laboratory tests. Requires either staying at a Gerson Center or hiring someone to prepare the large amount of juices required to do the program correctly. Very demanding in terms of time investment and will be practically impossible to continue working, especially in the initial stages. The only recommended juicing machine costs over $2000. Requires large amounts of organic produce, which may be expensive. Requires a variety of nutritional supplements. Some people may object to the use of coffee enemas. Healing the Gerson Way provides an outline of the theory and practice of the Gerson Therapy, which has been used as an alternative treatment for cancer and other serious diseases. It is an extremely intensive and demanding protocol that requires the consumption of fresh juices at hourly intervals throughout the day, as well as the regular use of coffee enemas.